Mark Scheifele fed a pass across to Jacob Trouba on the right side. Trouba fired a shot from the top right circle that was stopped by Corey Crawford, but the rebound bounced to Patrik Laine who fired it in. Marcus Kruger let a shot go from the slot that missed the net. The rebound bounced to the side of the net where Andreas Martinsen gathered it and tried to tuck it in. He was stopped by Connor Hellebuyck, but the rebound bounced to the top of the crease where Kruger lifted the puck over Hellebuyck and in. From the left wall, Mark Scheifele passed across the ice to a streaking Blake Wheeler, who moved into the right circle before sliding a pass across to Nikolaj Ehlers at the top of the crease. Ehlers redirected the puck past Crawford and in. David Kampf jumped on a loose puck puck behind the Jets defence and broke in alone on Connor Hellebuyck, who stopped Kampf with is right pad, but John Hayden followed up and knocked home the rebound in the crease. 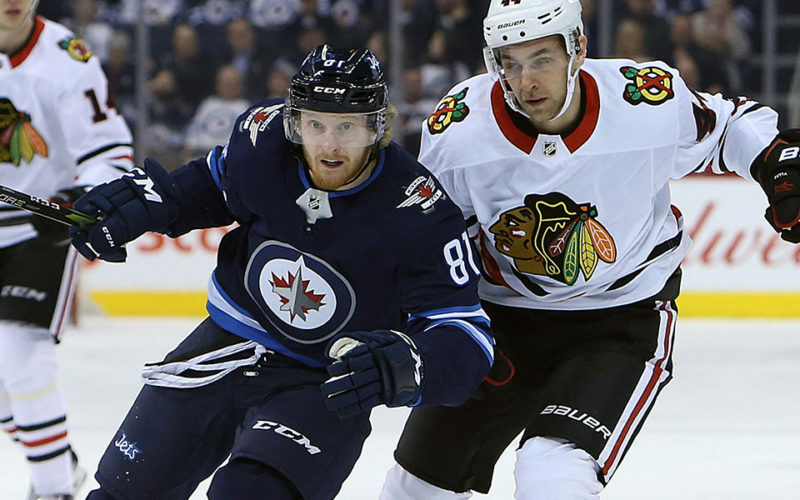 Blake Wheeler carried the puck over the Blackhawks blueline, dropped a pass to Nikolaj Ehlers at the left wall, and Ehlers was allowed to walk into the slot and fire a slapshot that beat Corey Crawford blocker-side and in. Mark Scheifele carried the puck into the Blackhawks zone, dropped the puck to Blake Wheeler, who gave it back to Scheifele in the left circle. Scheifele fed a pass to Jacob Trouba at the top of the crease who’s redirect was blocked, but Trouba found the rebound at the side of the Blackhawks net and slid it in. A Jets clearing attempt bounced off David Kampf to Jan Rutta near the blueline. Rutta moved to the middle of the ice, and fired a slapshot that bounced off the glove of Connor Hellebuyck and in. With the Jets on a power play, Jan Rutta took the puck from behind his own net and skated out front where Patrik Laine stole it in the left circle and snapped a shot glove side on Corey Crawford and in. Nikolaj Ehlers picked off a pass at his own blueline, broke in alone on Corey Crawford and slid the puck between Crawford”s legs and in. John Hayden gathered a loose puck in the right corner and sent a pass in front towards Dominik Kahun. As the puck bounced high in the air, Kahun gloved it down at the top of the crease and, after having his first shot stopped, he was able to score on his second opportunity. Alex DeBrincat chipped the puck past a Jets defensemen on the left wall, sent a pass to Patrick Kane in the slot, who slid a pass to Artem Anisimov to the right of the Jets net. Anisimov lifted a shot over the arm of Hellebuyck and in. Winnipeg improves to 14-8-2 on the season and 9-3-2 at Bell MTS Place. The Jets improve to 5-3-0 against Central Division opponents. Winnipeg went 1-for-3 on the power play, and are an NHL-best 13-for-36 (36.1%) at home this season. The Jets have scored six-or-more goals three times this season. Has five points (3G, 2A) in his last two games. Opened the scoring with his 100th career goal. He’s the fastest player in franchise history to reach 100 goals by doing it in 178 games. He’s also the fourth youngest player in NHL history to reach 100 by reaching it at the age of 20 years and 224 days. Tied a franchise record by scoring his 20th goal in 24 games to start a season. Scored his second goal of the game in the third period, tying an NHL record for goals in a single November with 18. In the last 30 seasons, only 4 times has a player recorded more in a calendar month. Leads the NHL in goals with 21. Led the Jets with three hits tonight and leads the team with 67 on the season. Was the Jets top faceoff man tonight, going 11-for-16 (69%) at the dot. Played a career-high 28:59 tonight. Had three assists tonight, which matches a career high. It’s his fourth multi-assist game of the season. Extended his point streak to three games, and now has six points (2G, 4A) during the streak. Led the Jets with six shots tonight. Had three assists tonight, marking the third time this season he’s had three assists or more in a game. Extended his point streak to three games, and now has seven points (1G, 6A) during the streak. Had two points tonight (1G, 1A). It’s Trouba’s second multi-point game of the season. Registered his first NHL point in his first game with the Winnipeg Jets with an assist on Nikolaj Ehlers second period goal. Schilling previously suited up for six NHL games with the Washington Capitals over three seasons from 2012-2015.